For the uninformed ( like myself) McQueen is a glorious surprise, though I went in primed with expectations from Anthony Lane's New Yorker review ("The first half of the documentary is an indubitable thrill. The second half is almost too sad for words"). He liked the documentary more than he usually likes a movie; he likened it to the big one about Amy Winehouse. Both had London cabbie fathers; fabulous careers in their chosen arts (she, music, he, fashion) marked by rapid rise and sad declines ending in their deaths. Amy was gloomier, though. McQueen quickly emerges as a big chubby man (till the end when he becomes dangerously chiseled and handsome) who laughs and jokes a lot. Passionately serious, but always ready for a bit of fun. Until the grim end came he was fun to be with and people flocked around him, eager to work for free, once he had an atelier for them to join him in. In Alexander McQueen, known to friends and family as "Lee," we encounter the classic aspects of the great clothing designer, with alongside them qualities that set him quite apart. He was gay. In school he drew clothes in class all day, ignoring the subjects. During a youthful apprenticeship on Savile Row, mainly Anderson & Sheppard, for two years, he showed a passion and a knack for sewing. He was always a demon for work. Clearly Yves Saint Laurent and Karl Lagerfeld are like this. But one cannot imagine another creating a show, headlined "Asylum," whose climax was a tableau based on a Joel-Peter Witkin photograph of a fat, naked woman reclining with a tubular mask. There is a difference between the two reclining women though. Witkin's woman is lying back, as if weighed down by her immense, ugly dugs; McQueen's is more a chubby odalisque, leaning forward to offer herself. But she's still strange and creepy for the climax of a fashion show. McQueen's taste for the shocking and the surreal rejects the essential prettiness of much French fashion. And when he was hired as the designer at Givenchy, he visited the other shows and scoffed at that prettiness. His gift for the shock of the new was controversial. A catwalk event drawing its theme from Jack the Ripper? Another of women stumbling along the runway as one who has been raped, breasts hanging out, clothes ripped and bloodstained? Perhaps a defense of beleaguered women? McQueen is the poète maudit of modern fashion. He wants to épater the bourgeois public. Cocteau said : "Fashion should look beautiful first and ugly later. Art should look ugly first, beautiful later." Not quite the McQueen way. His fashion could be ugly first too, and maybe never beautiful, but haunting and for some, inspiring. 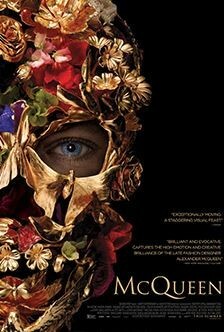 Only at the end of this film does it show a gallery of some of his gowns, without rips, masks, horns, or wings, showing how simply beautiful and intricate they could be. But the shows are shows. He is putting on a drama, and the drama might take people to a disturbing place. He didn't want the public to walk out as if they'd "just had Sunday lunch," he said. "I want them to be repulsed or exhilarated." He wanted them shaken, altered, filled with emotion. In the end Cocteau's mot, thought-provoking, and appropriate to twentieth-century art though it may be, starts to feel irrelevant. Fashion is simply a particular kind of art, a kind that's useful and practical, because it clothes you, but also makes you distinguished. It's an ephemeral art, because the clothes wear out, go out of style (but great designers never really "go out of style," they simply become museum pieces, and appear in the V&A's and Metropolitan Museum's extraordinarily popular memorial McQueen exhibition, "Savage Beauty"). The shows and the work and the clothes need to be recorded. And this is where Peter Ettedgui and Ian Bonhôte's conventional but rich documentary comes in. There is plenty of footage of McQueen himself (some of it's pretty blurry), even an interview with the now discredited Charlie Rose (not shown). The mainstays of the film, though, are the key figures in his life, the talking heads, which Mike D'Angelo understandably objects to having in a documentary film. Unfortunately not all documentaries are personal discoveries; some must come to others for retelling. The record of McQueen's shows, his clothes, and his life is essential material, particularly because of the ephemeral nature of all three of these things. Lee Alexander McQueen hanged himself at his house in Mayfair, London, at forty, a day after the death of his mother. Why did he have to end it so young? His death is, as Lane wrote, almost too sad for words. The only explanation is money and fame were to much for him. The film records that when he realized he was famous - known to people, just as a celebrity, not for his fashion design - it was a nasty shock to him. And it's repeatedly said that he did not do his work for the money. With the fame and the money, a great deal of both, came drugs, and the drugs had a very bad effect. But he also seems to have felt his career itself had become a trap. He couldn't take a break, because fifty people and their families were dependent on him. His responsibilities meant putting on fourteen shows a year, and it was a grind, exhausting, leaving no time for life or love or taking a breath. Too tight a fit, and as Esquire says, not a good fit, ultimately, because this film shows "the fashion world had a genius on its hands, and that they didn’t have a clue what to do with him." And then, he seems always to have been obsessed by death. This is a film you'd have to watch again and again, if you can bear it, because its contents are rich. You could watch it again just for the interiors behind the talking heads. Living well is the best revenge. They have some nice pads. McQueen, 111 mins., debuted 22 Apr.. 2018 at Tribeca, showing at a handful of other festivals and opeing in UK cinemas 8 Jun.2018 US release 20 Jul. Viewed at San Francisco release, Embarcadero Cinema 27 Jul. 2018. Metascore 84%.